These words began my speech at the Celebration of Leadership where I accepted the award of GSAFE Educator of the Year last May. These words are the perfect summation of why I believe being out made me a better teacher. These words are also indicative of why I am leaving the profession. It is not because I can no longer be a proud queer public school teacher; it is because I no longer believe that is enough. I said I was a proud queer public school teacher because I love the work I do with students as a public educator, but also because I am proud I can be an out queer woman and a teacher at the same time. It is the intersection of these identities that made me an effective teacher because this intersection mandated I strive to create a safe space in my classroom. After all, I needed to be safe there, too. It is not my contention that teachers must be queer and out to be effective—far from it. I have known truly transformative teachers who are not queer and also those who are and are in the closet. What we all have in common is our understanding of the need for safe spaces. I happen to enter that understanding through my queerness; other teachers come to this understanding through different avenues, be they because of other oppressed identities or just really great professional development (I’m a big believer in great professional development; after all, I met my wife at an MMSD Welcoming Schools PD, which consisted of, of course, workshops on the importance of safe spaces and how to create them). And even though we all understand the need for safe spaces, we all go about creating them in different ways because we are all unique individuals. Me, I chose to create my safe space through the power of vulnerability. The language describing the state of being vulnerable is violent language, with definitions like “open to attack” and “susceptible to being wounded.” I would define being vulnerable as openly being a whole person when being a fraction of one would be easier. And that is who I was as a teacher. As a result, that is who my students were, too. As result, we created a safe space and we grew together. It felt a little bit like magic. And as a result, I am leaving teaching. This may sound contradictory. Let me explain. I have spent much of my life being a fraction of my whole self. It made me very unsafe. From the age of 14 to 24, I lived with an eating disorder. Its intensity varied over that decade, but it eventually became severe enough to endanger my life. Even in my darkest days, I refused to acknowledge my problem to myself and to those who loved me; looking back, I know this is because I did not feel worthy of living. Thankfully, those who loved me refused to accept this and convinced me to begin inpatient treatment. So in July of 2006, I checked into Laureate Psychiatric Hospital. Five months later, I discharged a different person—a whole, healthy person for the first time in my adult life. The decade I spent in the throes of my eating disorder was a hell I would not wish on anyone, but the journey out of it made me the person I am today. The work required to believe you are worthy of living is difficult and sometimes disturbing work, but most significantly, it is worth it. And as I gained my health, I gained a deeper understanding of myself. It was in a Tulsa, Oklahoma psych hospital that I first realized I was queer. In realizing I was worthy of love, I realized I was worthy of giving it, too, and to whom I wanted to give it. I grew up in the Unitarian Universalist church and had known many queer people my entire life, and while society at large told me queerness was wrong, I never received that message from my own family or community. If anything, I heard the opposite. Some of our closest family friends were queer, and my first protest, at the age of 8, was one organized by my church as a counter-protest of a Westboro Baptist Church anti-gay demonstration. Still, it took five months of soul-searching in a mental hospital for me to realize and accept my own queer identity. Yes, I think this partly shows the power of society’s stigma even in the face of the positive messages I received from my family and community. I think it also shows the power of mental illness. When I was my most ill, it was all-consuming. At its core, anorexia is a denial of the self, and for 10 years, I denied myself the possibility of anything outside of mere survival. Things like desire were not possible. Things like trust and vulnerability, integral in the coming out process, were unthinkable. This is why my healthy identity is so bound together with my queer identity. As a 35-year-old, I have now been a healthy adult longer than I was a sick one. Students are one of the reasons I got out of that disorder as well as many of the reasons I have stayed out. When I was trying to make my decision over whether or not to enter the hospital, I thought of all the people who believed in me despite the fact that I did not believe in myself. I thought of my hope to someday be a mother. I thought of my dream of becoming a teacher. I knew I was in no physical position to put myself in front of a classroom as a potential role model looking the way I looked and behaving the way I behaved. These were the primary reasons I got help. I share this story with my students. I actually think it makes me a better role model because it makes me a whole person who has been through struggle and come out on the other side. Too many of my students understand this struggle all too well. I wish eating disorders were a more foreign concept to them, but they are not. In telling this story, I make myself vulnerable, and my students respect the trust that involves. Respect is an important aspect of any student-teacher and teacher-student relationship. It is also a word that is so often thrown around in books about pedagogy and in professional development workshops that I fear it has lost much of its meaning. But trust and vulnerability? We don’t talk about those concepts, and they are, I would maintain, just as essential. Because they are what respect can be built upon. The most significant day of vulnerability and trust, and thus the most meaningful and proudest day of my teaching career, was November 9, 2016. Saying that this was the most vulnerable and trusting day ever in my classroom is no small statement considering my classroom was the home of soul-baring Open Mics during the annual poetry unit. Still, it is the day after the election that is burned in my memory. My students walked in that morning eerily quiet. They felt bewildered; they felt sad and lost; they felt more than a little betrayed. I didn’t know how to keep them safe anymore. I didn’t know how to teach this. So I turned class over to my students. We talked. And then something really special happened: We cried together. I had agonized over what to do that day all night and all morning. All I had written in my lesson plan book was “process the election,” but I wasn’t sure how to do that in the face of their raw emotion. As we talked, and as students cried together, I crafted a writing activity. I told them a wise president once said, “We must find time to stop and thank the people who make a difference in our lives.” I told them President John F. Kennedy would want them to reach out and thank people. I told them that a lot of people were going to be hurting or scared today. I told them it was a good day to think about expressing kindness. To think about gratitude. Who are you thankful for today? Who in your life could use a word of kindness? I told them to write that person a letter, a letter telling them why they were grateful for them and thanking them for being in their life. And this is where the magic happened. You could have heard a pin drop. I asked them to be kind, to reach out, and they were, and they did. They wrote to their parents, to neighbors, to teachers, to friends, to mentors in the community, to family. But most touching of all, they wrote to each other. They reached out to classmates they saw hurting, classmates having an especially hard time, and they said, “I’m here for you.” And they were. It was a day of intense vulnerability and trust, and I will hold these students and their stories with me for the rest of my life. Later, a former student currently in high school told me that when she woke up and heard the news of Trump’s election, she had the immediate thought, “I want to spend this morning in Ms. Swetz’s class.” I wish she had. I think she would have felt safe. I also wish she hadn’t felt she needed to come to my classroom to feel that safety. I wish she had more safe spaces than our classroom. I wish her world were a safe space, too. That is why I’m leaving teaching. I still love the work I do with students, but I am tired of spending a year creating and then living in a safe space with them only to reach June and push them out the door into the big, bad, unsafe world. It’s not as though my classroom existed in a vacuum; the big, bad world has always been a part of class. We discussed current events, we wrestled with our understanding of privilege, and we wrote about our difficult experiences, but thanks to our community, we were able to approach all of this feeling supported in our struggle. Where is that space, that safety, that support in Trump’s America? It is safe spaces that taught me I was worthy of living and of loving. Now that I am starting on a new journey in life as a graduate student in the University of Wisconsin’s LaFollette School of Public Affairs Masters program, I will continue to strive to create those spaces wherever I go. And now that I am starting on a new journey in love as a newly married spouse of that amazing human I met at an MMSD professional development, I know I have the support required to do so. Now it is time to take the lessons my students and I built together to the rest of the world. It is time to make our world a safe space. Because this country is not just Trump’s America, it is ours, too. Fatou (age 14): Everyone deserves a safe space, but then again, everyone should be able to go anywhere and already feel safe. To me, a safe space is somewhere I can be myself and not be judged. Somewhere my opinions are respected. Having my classroom as a safe space made it easier to go through the day. Even if my day started off bad, I would always remind myself that my safe space was always there. 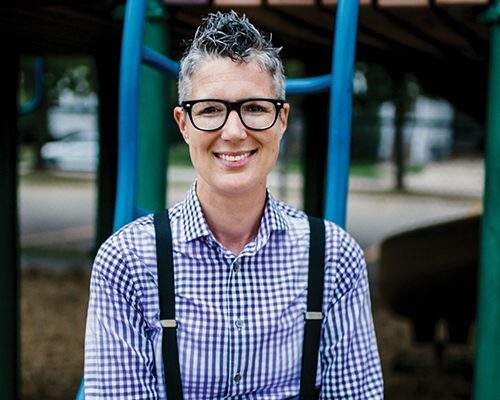 Having an out queer teacher gave me hope. Hope that my personality would be the main thing people see when they look at me, and not my sexuality. Hope that in the future I can go to work without having to worry about being harassed or judged. Ms. Swetz gave me that safe space, and Ms. Swetz gave me that hope. Rhys (age 15): I never really knew what a safe space was until I entered Ms. Swetz’s classroom, one of the most righteous and caring people I think I could ever know. She showed me what a safe space was; somewhere a person could say what they needed to say and it would be kept in that place without being disrespected or criticized. I have to say, I started the year as quite a shy guy with showing my emotions, but after I saw my chance with the safe space, I could tell my class anything about what was happening in my life, and I knew it would be respected. And that rule was sacred, making it a safe space was a space of raw emotion and truth telling. Without a safe space this year, I would still have my emotions kept inside of me, and that definitely isn’t OK. Thankfully, I was with Ms. Swetz, and she protected my class and me like a momma bear protecting her cubs. I cannot thank Ms. Swetz enough for what she has done for me, and I know others can’t thank her enough either. Nadja (age 14): In an environment like middle school where compromising your identity to fit into a label is the norm, a safe space that encourages inclusivity, intersectionality, and self-exploration is absolutely essential—yet rare. I was lucky enough to find such a space in Ms. Swetz’s class. As a member of her 8th grade homeroom, Social Studies, and English/Language Arts classes, I became more aware of current events that connected to me and my community, and developed my own opinions and reactions to them. I witnessed quiet, disengaged peers responding to our material in a way they hadn’t before. It made me proud to be growing alongside them, knowing they had finally found a place where they were heard and respected. In addition, I was a part of my school’s weekly Gender and Sexuality Alliance club. GSA, led by Ms. Swetz and another out gay teacher, was a safe space to me and many of my friends and peers; a space that I know those of us moving on will miss dearly. Twice every week we met for various reasons, but we were united by our need for community. While some meetings were carefree and silly, often providing release after a long day of judgement and sadness, others were down-to-earth and productive. We dedicated that time to events like the Day of Silence (which honors historically silenced communities such as women, LGBTQ+, Black Lives Matter, and others), reaching out to a larger community, hoping to cause change and acceptance. However, the GSA days I remember the most were the emotional ones, where we let out our anger, sadness, and fear. We cried and felt together, but the important part is that everyone felt safe because we were together, without fear of judgement or harassment, and we always left feeling as though things needed to change, and we had been given the tools with which to change them. To conclude, safe spaces MAKE A DIFFERENCE. They help people grow and learn about themselves as well as build community and essential values as active, informed members of society. Hazel (age 14): Having an out queer teacher is a special and rare thing for a multitude of reasons. It takes bravery to come out to 30 different people every year—many people struggle to do it once. It means this teacher probably has a wall or two to keep hateful comments out. Having a queer teacher is not the same as having an out queer teacher. It means they not only have walls, but being willing to knock down those walls to let others in. It’s selfless and for you at the same time. It creates meaning to the word “queer” other than a schoolyard taunt. It gave me hope to see that no matter what, someone was fighting. It showed people that being yourself is redeeming, because you can’t make a connection with a papier-mache dummy. Ms. Swetz came into the room every morning being herself, and being vulnerable. But she didn’t let people knock her down. When the election came, she was devastated. In room 202, we all were. She could’ve stayed home in bed and cried. She could’ve moped all day, throughout lessons. But she took this opportunity to let us connect with one another and learn that hope is always an option. 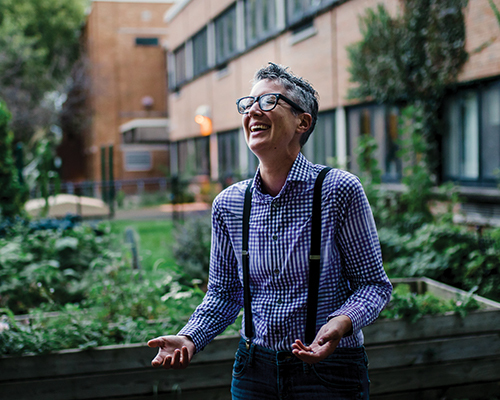 Abby was always herself in the classroom, and that is what helped her students understand that they could be themselves, too. Fear was always an option as well, but that it was far less redeeming than hope. She taught us day-to-day school things, but more importantly, she taught us to share, that being vulnerable and open is better than having walls and being safe, but alone.